The Yamaha Super Ténéré won the grueling Dakar Rally from 1991 through 1993 and then 1995 through 1998, a total of seven victories. Six victories at the hands of Stéphane Peterhansel and once with Edi Orioli. 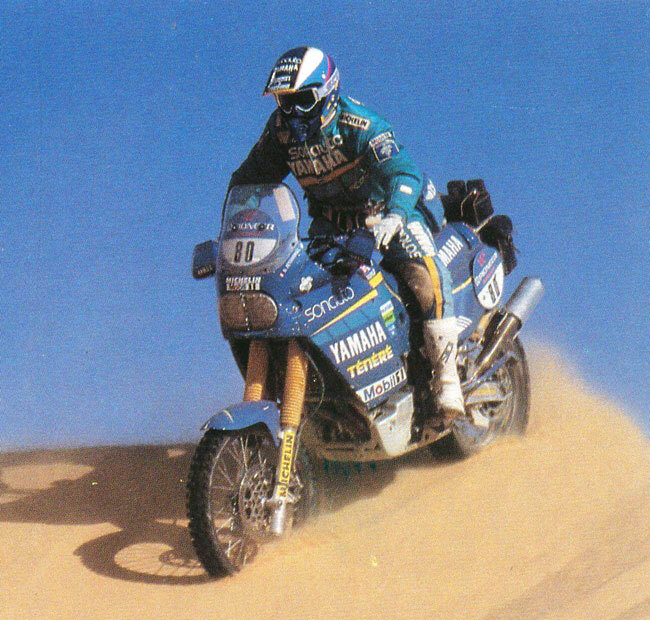 The Yamaha Super Ténéré YZE750 won the Dakar rally once and then six more times as an 850. 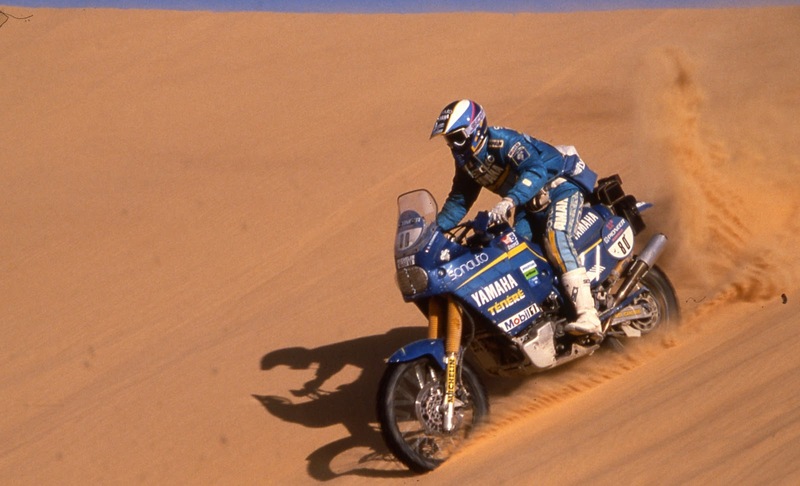 The motorcycle is named after the notorious Ténéré desert stage of the former Paris-Dakar Rally in northeastern Niger. This video is put together by Nicolas and his Youtube channel has lots of videos of Ténéré concepts. The video shows one of his concepts for the new Ténéré but it's so well put together and the music is so beautiful that it has become one of my favorites Ténéré videos. Yamaha Super Ténéré, a motorcycle, a legend. 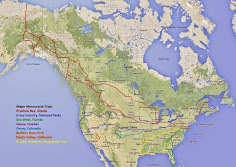 The spirit of adventure, travel and freedom. Music by Hans Zimmer: "Injection". The day I had been waiting for a long time finally arrived, I had hardly slept the night before. 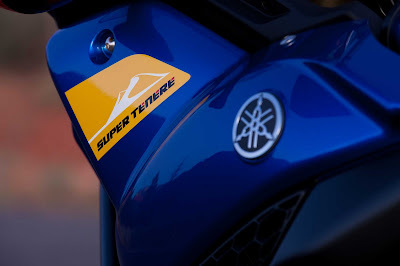 I had been eagerly awaiting the New York International Motorcycle show, it would be the first time I would have a chance to touch, sit on it and feel how the bike would fit me, I am talking about the highly anticipated showing of the 2012 Yamaha Super Ténéré. I had placed a deposit sight unseen last September after Yamaha made the announcement that it would bring the bike to the USA. I had spent the past few months reading discussions about it on various forums and reading reviews from magazines since the bike has been available from the beginning of last year around the world. I had invited my brother and dad to accompany me to New York City. They arrive at my house at 9.30am and after a brief chat and a cup of coffee, off we were to NYC, an hour and a half by car and train. Fifteen minutes into the trip it dawned on me I had left the tickets at home, what with all the excitement I had left them on top of the kitchen counter. A quick turn around and fifteen minutes later I was home to the surprise of my wife. A minute later I was back on the road on the way to Newark to catch the train into the city. The Newark train station is very old and mostly falling apart but it's the quickest way to get into the city. 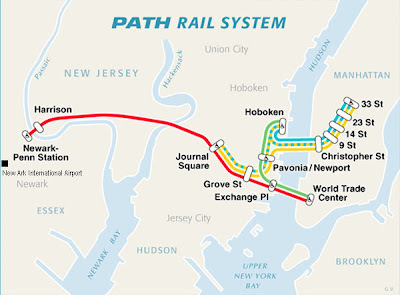 We hop on the Path Train and twenty minutes later we arrive at the end of the line, 33rd Street and 6th Avenue (Avenue of the Americas). It was very cold, about 18 degrees F (-7.7 C) when we got to the city and for those that have never been to NYC, let me tell you, the tall buildings create freezing canyons when the wind is blowing. The wind will make it feel at least 10 degrees colder, in other words, it was ridiculously COLD. We walk the six blocks to the Javits Center stopping for brunch along the way and to warm ourselves with a cup of coffee. The Javits Center has over 675,000 square feet (62,700 m2) of exhibit space and it's an amazing structure of glass and concrete. We get there and notice there's the motorcycle show on the bottom floor and a boat show on the upper floor. I always get amazed at the custom bikes, the ingenuity, man hours and money that goes into these bikes is truly amazing but I can't imagine riding these bikes any longer than a few blocks or to the nearest show area. There were quite a few on display and these are some of the most amazing I saw. Next it was the Kawasaki booth to see the new 2011 Kawasaki Ninja ZX-10R. I have a soft spot for sport bikes and the Ninja would be at the top of the list if I was on the market for one, the other would be the Yamaha YZF-R1. Next I headed to the Yamaha booth to see my future bike, I was on pins and needles in anticipation and then there it was, a beautiful "Impact Blue" model. After agonizing over the color, I had picked a "Raven" but I also like the metallic blue used on the "Impact Blue" model. My biggest concern was the height of the bike but after sitting on it I was so happy I could almost flat foot both feet with the seat on the highest position. I then sat on the other floor model which had the seat in the lower position and this time I was able to flat foot both feet, what a relief. The second bike also had the aluminum panniers, tank bag, aluminum skid plate and engine guard. The Super Ténéré is all I was expecting and more, now I have four more agonizing months of waiting for the bike to arrive, first deliveries are projected for May. Time to start making the list of accessories I will need, pull out the maps and start planning some adventures. The all-new 1199cc parallel twin liquid-cooled engine features a unique 270° crank for superior traction because both pistons fire so closely together. It’s almost like having a big-bore thumper without the uncomfortable vibration. I would like to wish a Happy New Year to everyone that has visited my blog and specially want to say thank you to the followers for sticking with me. I thank you all for the kind comments, friendship and the sense of camaraderie shown. I have enjoyed following your blogs and will try to set aside more time to read all the blogs I am following. A new riding season will soon be upon us and my second wish is for safe riding to everyone and may you enjoy as many miles on your motorcycle as possible. I'm sure there will be many new adventures and places to be discovered on two wheels and I can't wait to read about it and see all the beautiful pictures of this beautiful country. My third wish and I think everyone will agree with me, is for this winter season to end and for all the snow to melt and disappear as soon as possible. I am already tired of all the snow and ice that has fallen since mid December and the weather man is predicting more snow for tonight. I woke up on December 27th and this was the view from my garage. My cars were buried in the snow and I had forgotten to get the snow blower out of the shed. A foot and a half of the white stuff had fallen overnight and had managed to paralyze the tri-state area. I struggled to get the snow blower out of the shed and then had to drag it all the way to the garage before I could attempt to start it. I plug the electrical cord, press the start button and all I hear is the whine from the electric starter motor. After a few more futile attempts, I take the cover off only to discover that the plastic gear that engages the flywheel had disintegrated. I guess the very cold temperature didn't help the material and neither did the age of the blower. At this point I'm cursing like a drunken sailor but soon my neighbor came by with his little Cat and helped me clear the snow out of the driveway behind the cars and the street in front of my house. Another neighbor offered his snow blower and I was able to clear a path around the cars and all the way to the front of the house. It was hard work even with the blower, the wind blowing fast and furious and throwing it back at me but after some cursing and a few cups of hot chocolate I was finally done. My daughter in the mean time was having fun with her friends and decided to build an igloo in the middle of the road after my friend had created a huge mountain of snow with his little Caterpillar. It seems like kids don't feel the cold the way we do, I retreated to the couch with another cup of chocolate. On January 1st, my wife and I go to New York and board the Norwegian Gem, starting the new year by going on a cruise to the Caribbean for 11 days. We had planned this cruise earlier in the year and were accompanied by high school friends from South Africa we hadn't seen in 26 years. It was cold as we left New York but warmer temperatures were ahead of us. We visited Puerto Rico, St. Thomas, Antigua, Saint Martin and Tortola. The weather was beautiful, the sky mostly clear with every afternoon offering us beautiful sunsets. There is something special about sunsets at sea for me, maybe because I live on the east coast and don't see the sun setting over the water. Every afternoon I made my way to the top of the ship to see the sun disappear over the horizon. The water and the beaches were spectacular. If you ever go to St. Thomas, make sure you visit Magens Bay. In Antigua the beach was simply stunning but I can not recall the name of the beach. In Saint Martin we visited Bikini Beach and spent most of the time in the water while there. We return to New York on the 11th and that same night we have another snow storm, it was fun for my South African friends since they don't have any snow where they live but I had to take them to the airport the next day and I was not ready to shovel snow again. This time we had about 6 inches, just enough to be annoying. We spent the last night together throwing snowballs at each other, a big snowball fight soon ensued while my daughter made snow Angels. Tonight we are supposed to have another snow storm, three to six inches which will make tomorrow's commute to work just horrible, I can not stand this weather anymore. 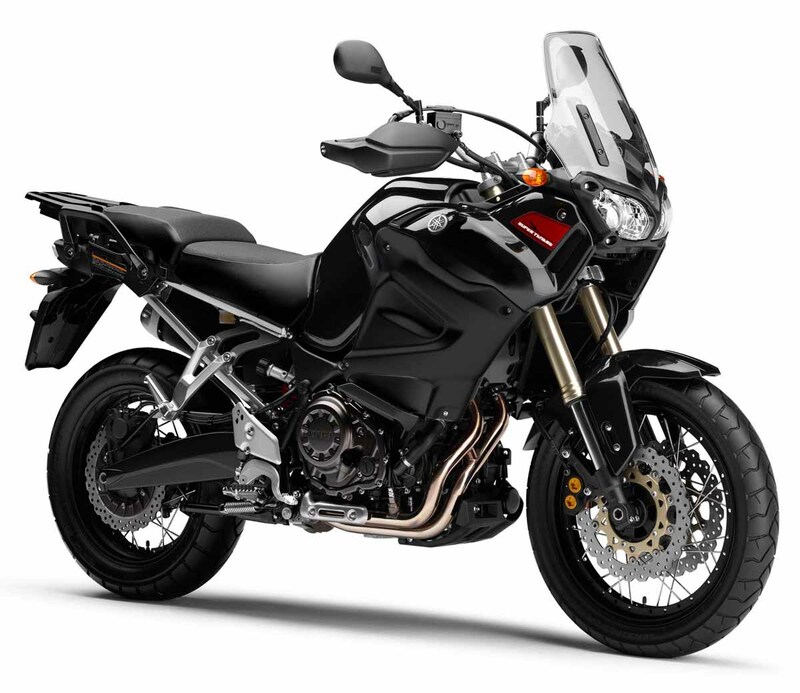 This weekend I am going to New York to the International Motorcycle Show to see for the first time my future bike, the Yamaha Super Ténéré, I hope the snow will be all gone before the weekend. So back to my third wish, lets hope it happens soon so we can all start riding again.